Spoken by a true Socialist, Communist Barack H. Obama. Obama was required to write a 'senior seminar' paper in order to graduate from Columbia. The subject of this paper, which totaled 44 pages, was American government. Entitled Aristocracy Reborn, this paper chronicled the long struggle of the working class against, as Obama put it, "plutocratic thugs with one hand on the money and the other on the government." Here we see the classic communist thought pattern of viewing everything through the Marxist lens of the class struggle, the oppressed proletariat against the wealthy bourgeoisie only reborn in the modern fascist vernacular. So now that Mr. obama is in "office"; has he become a "plutocratic thug with one hand on the money and the other on the government." the very thing that he once opposed? Is he now instituting a new Obama American Aristocracy to replace the constitution which he obviously disdains and holds in contempt? One wonders. Joe "The Plumber" was driven by that deep American spirit of Independence, a spirit born of the American heritage of hard work and believing that what you earn is rightfully yours, guaranteed by the Constitution and Bill of Rights. When "Joe" spoke to Mr. Obama, briefly for five minutes during a campaign stop in Ohio he was hoping for an honest answer. In his response to "Joe" Mr. Obama revealed his true socialist, communist roots. 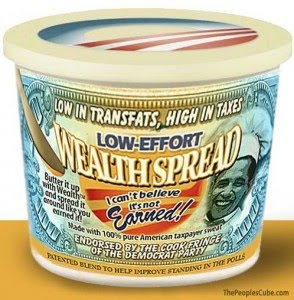 The communist, socialist mantra of wealth redistribution was revealed in Mr. Obama's response. One can only wonder at the spirit of delusion that deceived so many people regarding Mr. Obama's true intentions.